Free, Functional and Flexible, Notebook+ is your best choice for taking notes on your iPad. Notebook+ provides you with smooth and comfortable experience when you’re writing, texting, taking notes, or just doodling. Notebook+ is perfect for your everyday use, as simple as you’re writing on the actual notebook with your hand, with much more productivity and convenience. Start your journey with Notebook+, right here, right NOW! And it’s totally FREE!!!!! ☆Write freely with your hand on your iPad. Write down anything you want to record, and please let Notebook+ take good care of all your notes. ☆Support keyboard input. Write down everything with the keyboard on the screen. Notebook+ makes it much easier and more convenient for taking notes. Just feel like typing on the actual keyboard of your Mac or PC. ☆The Eraser function allows you to clear the specific area you want to delete. It’s flexible to choose the suitable eraser size as you wish. 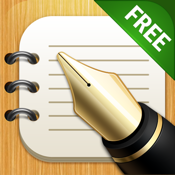 ☆Undo/Redo icon enables you to get your previously written contents and deleted notes back. ☆Get the whole picture of all your files in the main menu, it’s easy to click on any file you want to edit and open it conveniently. ☆Write as many pages as you want, Notebook+ supports your limitless creativity. ☆Your notes are shown as books on the shelves in the main menu, you can rename them and put them in order for your convenience. ☆Set your own choice of fonts and colors. Your notes, your style. If you want more professional functions such as Air print, Sync with iTunes, Facebook one-key update and no more ads, please check the Notebook+ Pro Version out. Notebook+ Free, your daily note-taking companion. Experience it and Enjoy it.